Home Legal marketing How do people find and hire attorneys? How do people find and hire attorneys? 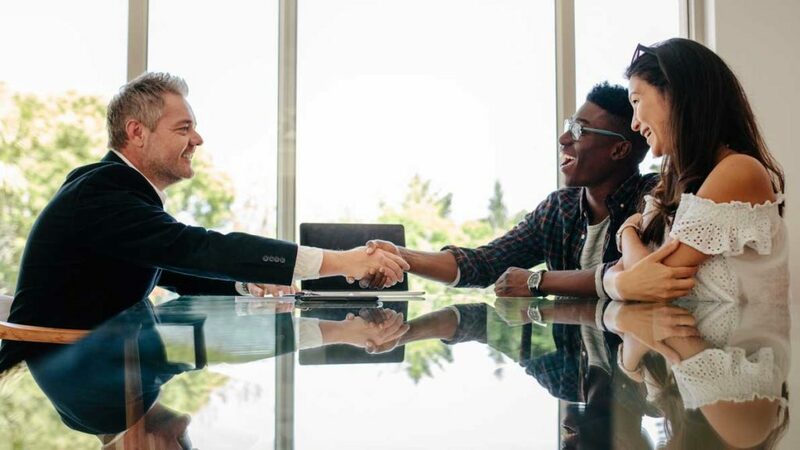 Understanding how people find and hire attorneys might just be the most important question related to growing your law practice. Even better: understand how the clients you want find and hire attorneys like you. Different people find different types of lawyers in a multitude of ways. 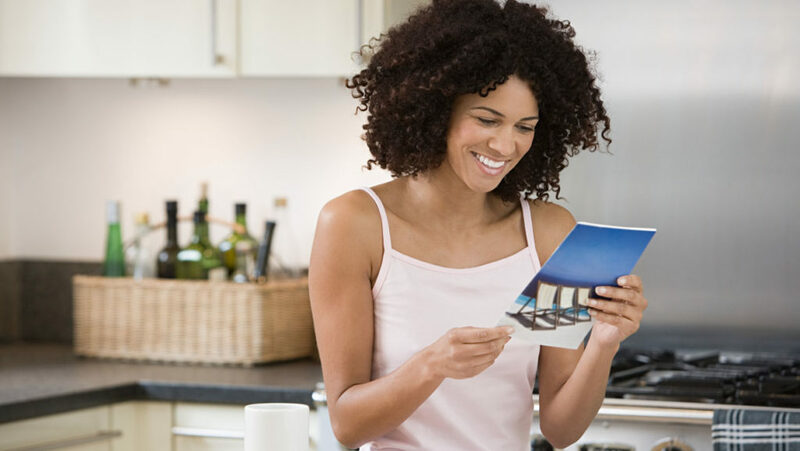 Here are some ideas to help you get started. In a recent Google survey conducted by Moses & Rooth, survey participants were first asked: when you need to find a specialty lawyer how would you start your search? Not surprisingly, most people responded that they would ask a friend. Even in the online-social-information age, people still rely on their friends, as well as other people they trust (ask my current lawyer was at 20.1 percent). 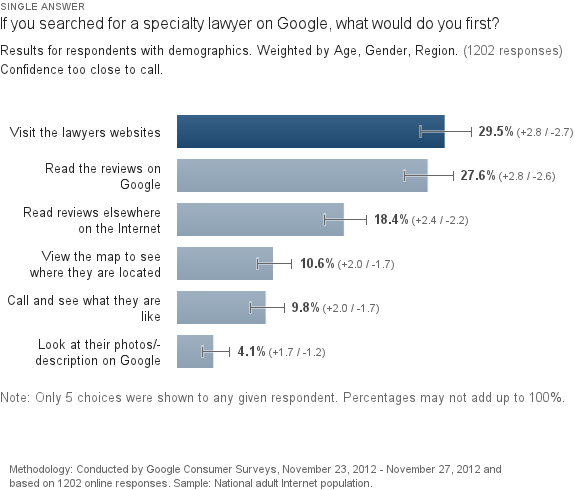 Growing word of mouth referrals is likely to remain the most effective and efficient way that lawyers get new clients. But word of mouth isn’t limited to face-to-face communication. Increasingly, word of mouth includes a variety of nonverbal, non-face-to-face communications. But look what came it at number two (21.9 percent): search. If you’re a lawyer, this may be difficult to comprehend. A lawyer is extremely unlikely to begin their search for another lawyer at a search engine. Lawyers know lawyers. Lawyers are related to lawyers. They’re married to lawyers (yeesh). Their friends are lawyers. Their acquaintances are lawyers. But even in the country with the most attorneys per capita, many people don’t know a single attorney. 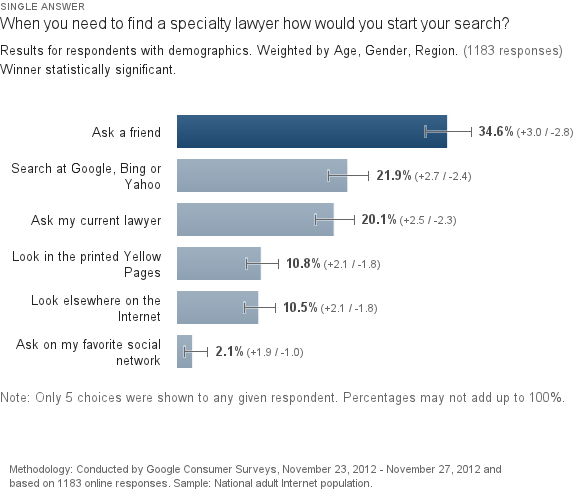 And so, you shouldn’t be astonished that many people use search engines to find attorneys. In fact, about 34 percent of the respondents indicated that they would start their search with something related to the internet. Does that mean you should drop everything and spend all of your time learning SEO, blogging, and social media marketing? Of course not. Refer back to what I said earlier: different people find different types of lawyers in a multitude of ways. The people that you want to hire you may not use the internet at all in beginning their search for the type of services you provide. Read the reviews on Google: 27.6 percent, Read reviews elsewhere on the internet: 18.4 percent. 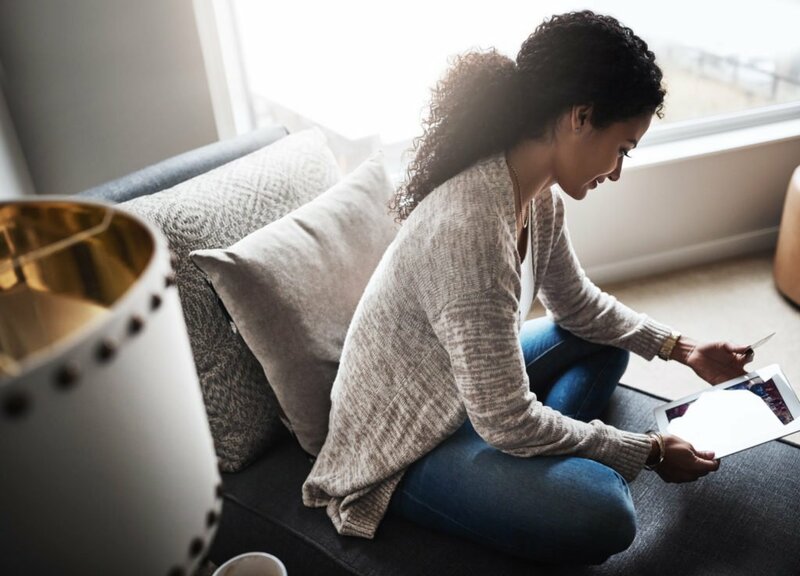 When people look you up online, what they see matters. 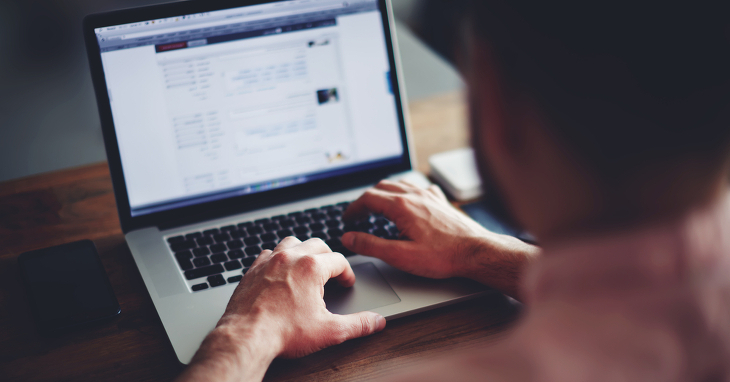 If your target potential clients use the internet to begin their search, it’s becoming more and more likely that, at some point, they’ll look for information about you online. 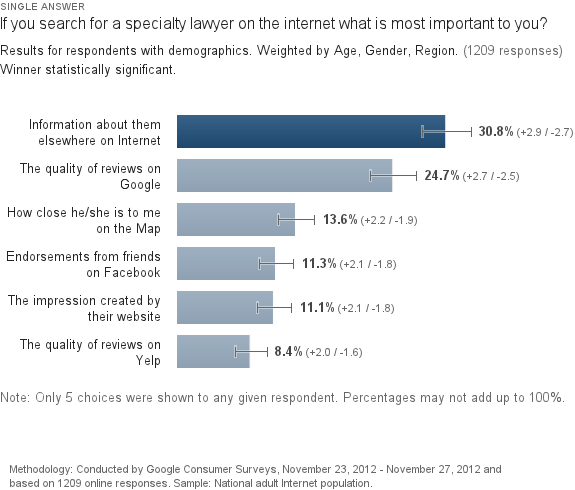 And when the respondents were asked: if you search for a specialty lawyer on the internet what is most important to you? People expect to be able to find information out about you online. And for respondents in this study, more than 70 percent expected to find information that exists somewhere besides the lawyer’s website. That’s profound. Of course, this study is not comprehensive. And maybe your clients don’t use the internet to start their search for lawyers like you. But even if they don’t I suggest that at some point they’re going to look you up online. And even if they don’t today, they’re going to tomorrow. The world has changed. Have you noticed? How Can Attorneys Communicate the Value of Their Services? 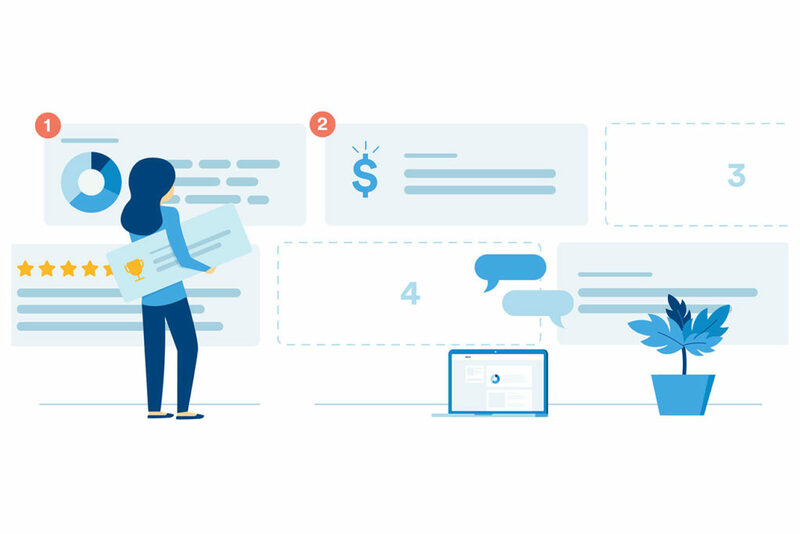 Assuming that you understand how the clients you want find and hire lawyers like you, the next step is understanding how you can communicate the value of your services to them. And it should be obvious to you that it begins with doing a good job. Doing good work should be the Archimedean point from which all of your client development activities are viewed. But while doing good work and providing excellent service to clients are the foundation of building a successful practice, they won’t necessarily keep the rain out. You have to communicate the value of your services to prospective clients. Start with competent representation. Move to excellent representation. And marshal the evidence of your experience and reputation. You might not think of it this way, but you’re constantly teaching. You teach clients. You teach jurors. And if you’re good, you teach other lawyers. Teaching is the best way to communicate your knowledge, skill and experience. And the more people you do a good job of teaching, the more people will come to you to learn. You can teach by writing. You can teach by speaking. You can teach by your actions. And, thanks to the internet, what you write, what you say and even what actions you take has almost limitless reach. Of course, your reach primarily depends on how what you communicate to your audience. Get better at teaching, and you will get better at attracting clients. Refer back to how the majority of survey respondents answered question number one: when you need to find a specialty lawyer how would you start your search? They would ask a friend. You don’t think business development is about making friends? Good luck. If you do nothing else to proactively grow your practice, you should try to make friends. If you’re not good at making friends, you should practice. Admittedly, friend-making is much more art than science. All of the nuances of how friendships are created, nurtured and solidified can’t be articulated in a single blog post, book or in continuing legal education. (Hopefully you paid attention in kindergarten.) But if you didn’t, or if you just aren’t wired for it, I recommend that you make conscious efforts to get better at making friends. Fortunately, technology has provided you with a variety of ways to socialize without having to spend a ton of time and money meeting people and buying them dinner. If there’s any magic bullet in social media, it’s the ability to socialize with people you otherwise wouldn’t have been able to. How do your target potential clients find lawyers like you? What motivates them to hire you? How are you communicating the value of your services to them? View all articles by Gyi Tsakalakis. Great synopsis of ways to be found. 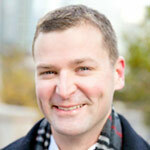 We use a variety of social media, blogs and organic SEO for bankruptcy in Bellevue Washington. We also are on a lot of local TV networks, talk shows and radio programs around town. I found your blog really insightful. Very interesting data. And I really found the run-through that you provided for each question's results informative. One of the results in particular got my attention... For the question "how would you start your search..." it was very telling that respondents use the printed yellow book about as often as other places on the net that are not search engines or social media sites. So, places like third party directory sites seem to be as popular for a direct search as the phone book. Clearly, the phone book still drives business but it is viewed as a shrinking advertising medium. And so, according to this survey, for direct searches, third party sites are pretty low on the totem poll. The "data" is biased. The "poll" was conducted online which means the people who answered the poll are heavy internet users. Most of these surveys are commission by companies like AVVO to tell them what they want to hear. Buy more AVVO kind of products. The more people tout "facts" the less reliable they tend to be. Re: "bias" In 2011, the ABA published a survey conducted on its behalf by Harris International. The survey was conducted via landline telephone! Its results were criticized as biased because no segment of the sample was selected via the Internet. Know where Ask a friend, Ask a lawyer I know, Yellow pages, Online search came out? Take a look at the survey, "Perspectives on Finding Personal Legal Services", ABA, February 2011. Two surveys, dueling biases, same results? Decide for yourself. the use of vanity toll free numbers provide a unique individual marketing tool and is exclusive to the market the attorney practices in. I agree with the friends are the best form of advertising. That is why doing a lot of community or public service is important, as well as pro bono work. You need to get your name out there and worth of mouth is key. Once people are talking about your good work, the more work you will get. I pay a visit day-to-day a few websites and sites to read content, except this web site gives quality based posts.